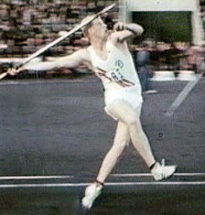 Terje Pedersen was the golden boy of javelin throwing from Oslo, Norway. He was 193 cm tall, weighing 93 kilograms, blond and handsome, and was the first person ever to throw a spear over 90 meters, setting a world record at 91.72 meters only five weeks prior to the start of the Tokyo Olympics in 1964. For the citizens of Norway, Nevala may have been expected to take home gold, joining three other Finnish throwers who had won gold in the javelin throw in prior Olympics. And yet, on that cold and wet day on October 14, 1964, Pedersen threw poorly, his best throw of 72.1 meters, nearly 20 meters off of his world record, fell .21 cm short of qualifying for the finals. Was Nevala unliked for some personal reason? As Pedersen had just set the world record so convincingly, was there room for only one national hero in the emotional mindshare of Norwegians? I don’t know. But Nevala assumed the mantle regardless. Nevala was certainly a deserving javelin thrower, his personal best of 86.33 being very close to the world record at the time in July 1963, but in the qualifying round at the Tokyo Games, he was in the middle of the pack with throws in the low 70s. In the final round, Nevala improved, throwing 76.42 meters and then 78.39 meters. In the fourth throw, he uncorked a throw of 82.66 meters to take the lead. Gergely Kulcsar of Hungary and Janis Lusis of the Soviet union tried desperately to hit that mark, but fell short as the long wet day dragged on. Nevala was the unexpected Finnish and Olympic champion. Below is footage of his winning throw. Hmmm…but what of Finnish champion Nevala? Posted in Others, Tokyo 1964, Track and FIeld and tagged 1964 Olympics, javelin throw, Pauli Nevala, Scandinavia, Terje Pedersen, tokyo olympics. Bookmark the permalink.